Just what are the boundaries of “southern Italy”? Sometimes people (both Italians and others) say that the north and south of Italy are like two different countries. Until about 150 years ago, they were two—and often more—countries, and for many centuries the south was the Kingdom of the Two Sicilies, or the Kingdom of Naples and the Kingdom of Sicily. It includes the island of Sicily and the “boot” up to Gaeta on the west coast, and further north, taking in modern day Abruzzo, on the Adriatic coast. 1440s CE: Aragon (Spanish) and Anjou (French) alternated for about 100 years. 1800s: Napoleon, Austrians, back to Bourbons. 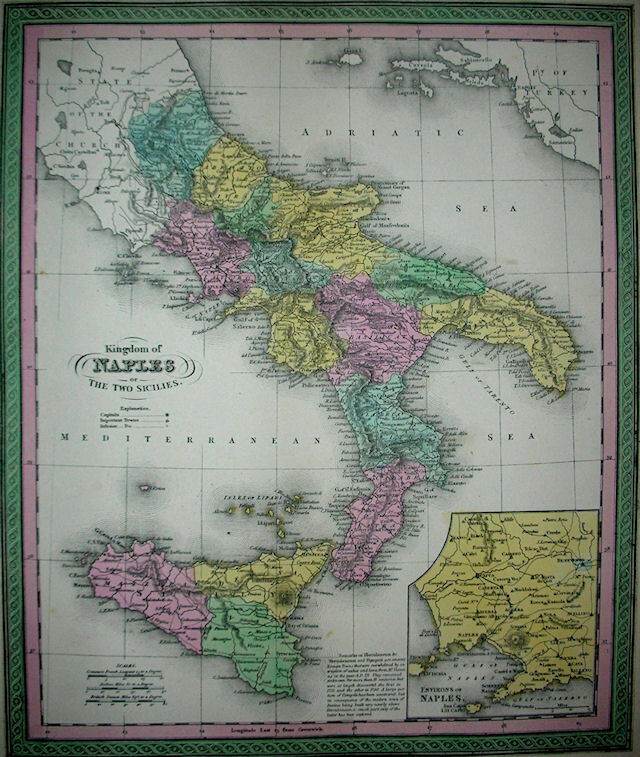 1816: Naples and Sicily united as the Kingdom of the Two Sicilies under the Bourbons. 1860/61: Briefly part of the Kingdom of Sardinia, then joined with the Kingdom of Italy. Complicated as it seems, I have simplified this chart greatly. The evidence of these groups show up in the architecture, dialects, family names, and foods of the region. America is often called a melting pot, but southern Italy is a strong rival for that title. When I talked with my mother about the invasions and influences on southern Italy, her face fell. “I thought we were Italian,” she said. “But it sounds like we aren’t.” If not, what are we? Her grandparents’ family names, Gualtieri and Arcuri, may provide clues to more distant origins. Behind the Name.com, a website on name origins, identifies Gualtieri as an adaptation of the name Walter, which is said to be of Norman origin. Arcuri closely resembles some Greek surnames. Could my ancestors have come to Italy with the ‘other’ Normans who controlled the south in the 1100s? Or with the founders of the Magna Graecia, the Greek settlers who arrived almost 3,000 years ago? I would love to know their stories! This is a great start! Your love of all things Italian is clear. What an enjoyable to share your enthusiasm with others. I have always had an affinity for Norway, Russia and Italy. I look forward to reading more.